Superb, spacious 2 bedroom 2nd floor apartment. Large terrace with table. Sea views, private pool (plus children's pool) & beautiful gardens. Peaceful elevated position yet 2 mins walk to local bars, cafes, restaurants, shops, bank, nightclub. 2 mins walk to Mercadona supermarket. 10 mins walk to the excellent Blue Flag La Mata Beach, with its stunning boardwalk into La Mata Centre. The beach is noted for its cleanliness, water quality and safety. A large and beautiful natural salt water lake surrounds La Mata, and is home to many species of birds, including flamingos. Torrevieja town is a 5 min drive away and is home to the famous Aquopolis - one of the biggest water parks on the Costa Blanca. Torrevieja is also known for its lively evening entertainment, as well as catering for many sports and water activities. Murcia airport is a 30 min drive, Alicante airport is a 35 min drive and there are 3 championship golf courses within 15 min drive. I am a 43 year old Architect. I bought this property for the close proximity to La Mata beach, quiet location and for the outdoor pool and extensive gardens. The location is half way between Murcia San Javier Airport and Alicante Airport, making accessibility very easy, especially for visitors from the UK. The board walk along La Mata beach is very pleasant, along with the large salt water lakes that are within walking distance. There are some excellent restaurants within a couple of minutes walk. The close proximity of the mercadona makes self catering very easy. Bathroom with bath/shower over, wc, wash basin, towel ring, mirror, electric shaving socket. Bath and hand towels included. Air conditioning is provided in the living area and is enough to cool the whole apartment. Heating is provided through the aircon unit and there are 2 portable oil filled radiators. All bed linen and pillows are provided. There is a 40 euros cleaning charge up to 4 people and 10 euros per extra person. This is paid locally and in addition to the quoted price. A washing machine is in the kitchen and clothes can be dried on the airer provided with plenty of space on the terrace where they dry very quickly. On street parking is available along the road outside the main entrance. There are no payment meters on the roads around the area. All bathroom towels are provided and should remain in the apartment. Please bring your own beach towels. Large Living/Dining Area with double sofa bed, dining table and chairs, coffee table, dresser, LED smart TV, DVD player, air con. Oven, hob, fridge/freezer, microwave, washing machine, kettle, toaster, iron, ironing board, clothes airer, tea towels and fully equipped with all pans, utensils, crockery, cutlery and glass ware. Children's non breakable crockery available if required. There is a dining area in the apartment with 4 chairs. There is also a table and 4 chairs on the large terrace. There is a 32 inch LED smart TV. There is a satellite box which receives a selection of British TV channels. There is a DVD player but please bring your own DVDs. There is a small selection of books for your use. There are well established planted gardens around the pool area which make a welcome retreat for picnicking and relaxation. There is a spacious terrace with sea views which can be accessed from both the living room and master bedroom. Perfect weather and beautiful scenery make Costa Blanca an absolute paradise for golfers and there are a variety of different courses all within a short distance from the apartment. Villamartin (15 min drive) - hosted the 1994 PGA Mediterranean Open, breathtaking in its beauty. Las Ramblas (15 min drive) - a demanding course that rambles through valleys with the occasional water hazard, more rugged terrain. Campoamor (15 min drive) - expansive fairways, excellent greens, incredible scenery, six "dog legs" can prove testing. La Marquesa (15 min drive) - less demanding, good for regaining your swing. La Finca (20 min drive) - one of the newest courses and greatest variety of greens on the Costa Blanca. El Plantio (40 min drive) - 18 hole and a 9 hole course, outstanding green and fairway quality, suitable for all levels and the whole family. La Manga (45 min drive) - a "Mecca" for golfers and headquarters of the European PGA, has two championship courses and an 18 hole course. There are steps up to the main entrance, however there is also wheel chair access via the upper garden gate which leads to the swimming pool entrance of the building on the other side which is level access. There is a secure pool available for guest's use which is shared among the apartments. The opening times are from 1st June to 29th September and is controlled by a life guard. Notes on accommodation: There is air conditioning in the Living Area which keeps the apartment cool in summer and warm in winter. There are ceiling fans in each bedroom and oil filled radiators for extra heating if required. The apartment is well suited for both children as well as adults due to the secure nature of the pool and garden facilities and close proximity to the beach, restaurants, etc. Outside: There is a large swimming pool with an adjoining children's pool within the self contained beautifully landscaped private gardens. The pool is accessed from the rear of the main apartment building. There is a life guard on duty between 11th June and 25th September. At all other times the pool is closed. The gardens are well lawned and are ideal for picnicking in the sun. The gardens and pool are for the sole use of residents and guests and are not open to the public. The apartment has its own private terrace area accessible from both the Living Area and Master Bedroom. There is a large table with four chairs and two sun loungers, making this an ideal retreat for sitting out while enjoying a glass of wine and admiring the sea views towards La Mata beach and the surrounding area. Cleaning / Towels / Linen / Maid service: Towels and bed linen are included. Please bring your own beach/swimming pool towels. The apartment is thoroughly cleaned before and after every rental and is checked prior to your arrival. Think we was the first let of the season as the apartment was a bit musky, but soon cleared with some fresh air. Was met by Chris to hand over the keys, very polite even though we were late back from the airport. The apartment is close to the local strip which has many good bars etc. The local supermarket is just over the road. The apartment itself was very clean and well maintained. Two large bedrooms with lots of storage space for your clothes. Plenty of cutlery etc on the small but adequate kitchen. Lovely gardens at the rear with a nice pool which unfortunately for us was not open yet.All in all an excellent apartment which l strongly recommend & we shall book again. The apartment is always spotless with every facility available. The gardens are a delight and there is a large swimming pool with a lifeguard on duty. Thank you for your review and we are very pleased you continue to enjoy your time in our apartment and in La Mata. Apartment was very well maintained and located 10 minute walk to beach. Plenty of good restraunts and bars around. Very convenient to local amenities with restaurants and bars, there is also a supermarket all within a five minute walk. You can walk to the beach in 10-15 minutes or catch a bus to Torrevieja or the beautiful La Mata. This is a lovely clean apartment with great sea views from the large balcony. It is close to walk to local bars and restaurants. It is a short walk to the beach. It is on the bus route to local towns torrevieja and la mata. The pool area has beautiful gardens. The owners are great to communicate with and are very helpfull. Me and my husband have been twice and would definitely go again. This is our 4th return to this apartment, and we will return again. We always have a lovely stay, from meeting Jose when we get the keys handed over is pleasant and easy. 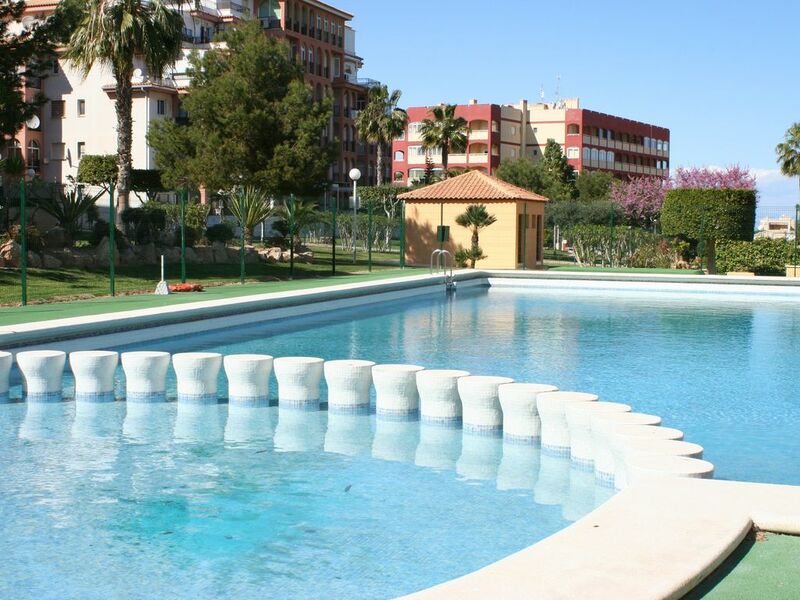 The apartment is situated a 10 minute walk away from the gorgeous La Mata beach. A local Mercadona supermarket is across the road for all your essentials, food alcohol etc. It's well kept with a comfortable double room. The shower in the bathroom is very powerful and really refreshing. During hot periods the air con in the lounge is a godsend. Many an evening spent on the balcony having a drink watching the sun go down. The apartment is a 5-10 min walk to La Mata Beach. This beautiful long sandy beach has held the European Blue Flag for several years and is noted for its cleanliness, water quality and safety. A 5 min drive will take you to five more lovely beaches around the large town of Torrevieja. The pine forest enclosed, long, sandy, beach at Guardamar del Segura is only a 15 min drive. The acclaimed healing properties of the natural mud baths at Lo Pagan are only a 30 min drive down the coast. La Mata is ideally situated between two major airports. Alicante airport to the north is a 35 min drive. Murcia airport (San Javier) to the south is a 30 min drive. Car hire is convenient but not essential, as there is a bus stop directly opposite the apartment (La Mata-Torrevieja Bus route C), which runs every hour from October-June, and every 30 mins from July-September. The main bus stop is on Church Square in La Mata Centre, and buses to Torrevieja & Alicante are every 20 mins. Parc Natural de La Mata (15 min walk) - walk or cycle around the large salt water lagoon. Torrevieja is 4.7km (10 min drive) - enjoy a fun packed day at The Aquopolis Water Park. Alicante is 47.6km (45 min drive) - admire panoramic views from Castillo de Santa Barbara, walk the steep narrow streets of the old town, or visit 'Panoramis' for some retail therapy. Benidorm is 115km (1hr 10 min drive) - home to Terra Mitica Theme Park, Terra Natura Safari Park & Mundomar Aquarium. El Italiano - a delightful Italian on the beach front at the bottom of Calle Soria. Xu Palace - a fabulous Chinese, with a large choice of excellent quality food & stylish decor (by the roundabout on the N332). For curry lovers there is a great Indian Restaurant (all you can eat buffet!) just off Calle Helena in C'tra del Torrejon (2 min walk). You will also find in this area several cafes, bars & restaurants, newsagent (selling English papers), small supermarket, chemist, bank, internet cafe, car hire & telephones. There are many good restaurants and bars in La Mata Centre around the main Church Square near the beach, and also on Avenida de los Europeos. There is a bustling street market in La Mata on Wednesday mornings on Canal del Acequion, where you can grab a bargain - clothing, leather, sandals, handbags, fruit & veg, etc. Alternatively, venture into Torrevieja town for the Friday market. Horse riding (El Refugio) by the salt lake. Go-karting at Playo Flamenca (15 min drive). Ten pin bowling located in Ozone Centro de Ocio (5 min drive), which also has a number of restaurants, a cinema & a disco. La Hoya Sports Complex (Torrevieja) has an olympic swimming pool, gymnasium, physiotherapy clinic, library & sauna. Activities include handball, basketball, roller-skate hockey, volleyball, 5-a-side football & tennis. Tabarca Island - take a boat trip from Torrevieja and explore this snorkeller's paradise. Elche (46.1km away /40 minute drive) - relax in Huerto del Cura, a fascinating botanical garden within the sub tropical pine forest of this world heritage site. Murcia (75.1km /55 min drive) - visit the impressive Catedral de Santa Maria, an excellent example of baroque architecture. Sierra de Espuna (111km away /1hr 5 min drive) - a pine clad mountain range with spectacular walking/mountain biking trails and serious climbing. Booking Notes: A booking is made via the HomeAway website. In due course you will receive an email direct from us with a booking form that you will need to fill in and send back to us. This form is then sent to our representative in Spain and you will be contacted directly by them with details of the key handover procedure. You will be required to pay 50 euros locally in cash at the end of your stay or 55 euros if you arrive after 18:30 in addition to the price quoted on this website. A £150 damage deposit is held by the HomeAway website and this will be fully refunded 7 days after check out if the apartment is left in the same condition as you found it, with the exception of the necessary reasonable cleaning required for the next guests. Changeover Day: Arrival/departure days are flexible. Check in is from 3pm, and check out is 10am. This may be negotiated subject to the arrival of other guests. Your stay may be extended subject to availability. All rubbish must be taken to the bins outside on the day of departure and all food removed from the fridge and cupboards. All crockery and utensils must be washed and put away. Booking Terms: Last minute bookings are accepted. No restriction on length of stay, however, there is a minimum rental charge of £125. Rates are negotiable for longer term lets so please contact us to discuss this if you are interested.